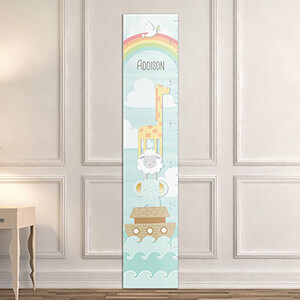 Perfect for all your picture-perfect photo ops, Baby Aspen's Personalized Noah's Ark Growth Chart measures all of your little one's monumental moments, and does so in style. The beautiful Noah's Ark design features fun, cuddly animals, and you can even personalize with baby's name onto this bible themed growth chart. Noah's Ark themed growth chart features Noah's Ark with animals and a rainbow at the top with clouds throughout. Name personalization is horizontally aligned in center of growth chart; includes up to 12 characters.